The first tantalising glimpses of a highly promising Formula 1 season ahead emerged at this week's second pre-season test in Barcelona. World champion Sebastian Vettel said after finishing his running at the Circuit de Catalunya that he expected the field to be "very close" and the evidence of four days in Spain suggested exactly that. McLaren's Sergio Perez set the fastest time of the week from Ferrari's Fernando Alonso by just 0.027 seconds, and there were further signs elsewhere that those may well be the sorts of margins the top teams are dealing with when the season starts in Melbourne in three weeks. Headline lap times are notoriously unreliable indicators of form - there are just too many variables involved to be sure they represent a car's true pace. The top teams rarely run their cars in full, low-fuel qualifying trim in testing as they do not want to show their hand to their rivals. But some things cannot be hidden. On Thursday afternoon, both world champions Red Bull and race-winning Lotus did race-simulation runs at the same time as each other, and by and large these tend to give a pretty accurate picture of relative form. It's a race distance, so you know they have pretty much the same level of fuel at the start, and their lap times over the duration can be compared. And the remarkable thing is that there was almost nothing to choose between the lap times of Red Bull's Mark Webber and Lotus's Romain Grosjean. Webber was quicker in the first two stints; Grosjean a bit faster in the second half of the 'race' and by the end there was only two seconds to choose between the two, with the Australian slightly ahead. It's not a perfectly accurate picture, because Webber did not get to finish a full distance (although this was taken into account in the calculation of relative pace), but it's as good as there is at this stage. Grosjean's run also suggested that some of the wilder claims about the speed with which the new, fast-wearing Pirelli tyres were wearing out in testing are likely to be allayed come the start of the season. Teams have been finding in Barcelona that they encounter 'graining' - where the surface tears and pace drops by seconds a lap - after just a couple of laps. The 'graining' causes high tyre wear and that in turn causes thermal degradation, where the amount of energy in the rubber simply runs out, because the tyre loses temperature and pressure. As a result, some drivers have been predicting races with as many as five pit stops. But wiser, more experienced heads, such as world champions Button and Kimi Raikkonen, said that tyre degradation and wear were always bad in the cold conditions of pre-season testing. They expect the problem to reduce dramatically in the warmer conditions at grands prix and as the teams learn how to manage the tyres. As indeed happened in both of the last two seasons. Grosjean seemed to prove them right with a remarkable 24-lap stint on the 'medium' tyre in the second half of his race-simulation test. That achievement impressed several up and down the pit lane. But, while it is true the Lotus had good tyre wear last year and seems to have kept that for this season, if they can do it, others can, too. So what the race runs by Webber and Grosjean proved is that, in the specification in which the cars were running at the second test, there is virtually nothing to choose between Red Bull and Lotus. So what of the other top teams, Ferrari, McLaren and Mercedes? Taking Mercedes first, it would be asking a lot to expect a team that was struggling to score points by the end of last season to make up enough time on leading rivals to be able to battle for wins at the start of this. And new signing Lewis Hamilton backed that up, saying: "We're not looking at wins at the moment. We're hoping to get into the points and fight for the top 10." But the car has actually looked pretty quick - and Hamilton set a very impressive-looking lap time on hard tyres on the second day of the test. Is he perhaps engaging in a bit of expectation management, trying to take the pressure off a high-profile new partnership? It's difficult to be sure, but Hamilton did add: "It's not fast enough to be the quickest over one lap but it's not slow, that's for sure." With Ferrari and McLaren, it gets even harder to read, although on the face of it both cars look fast. Despite Perez's quickest time, and a positive summation of his work by the Mexican, Button was more circumspect at the end of his only day of dry running, saying the team had had "a tricky winter so far". "It's been very tricky to understand where the car is," Button said. "At times the car feels good; at other times it doesn't." This assessment was backed up by engineers from rival teams, who watched Button doing long runs on Thursday afternoon and said the car was not a match for the Red Bull and Lotus. But then talk to Williams driver Valtteri Bottas and, while he concedes it is "difficult to judge", he says: "For sure Red Bull, McLaren and Lotus are strong." Ferrari are even more mysterious. 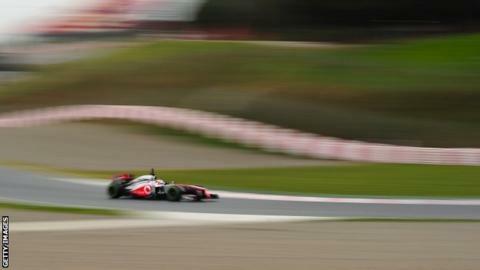 Alonso's fastest time of the week came on a four-lap run, whereas Perez did only a single flying lap. If each had only enough fuel to complete the run, that means Alonso could actually have gone faster than the McLaren to the tune of more than 0.2secs, which would give him comfortably the fastest time of the week. We thought it might be quite fun to have a guess at what the top half of the grid for the Australian Grand Prix might look like. But it is unlikely that either Ferrari or McLaren would reveal their hand by having only enough fuel to complete a quickish run. Engineers from rival teams say the likelihood is each had in the region of 30-40kg in the tank, which at about 0.38secs per 10kg would add a second or more to the times the cars could achieve. Ferrari tend to run a bit lighter than McLaren and Red Bull on equivalent runs, but it still suggests the Ferrari is there or thereabouts, despite Alonso's own low-key assessment and downbeat demeanour when he met the media on Tuesday. Normally, it would be possible to cross-correlate these lowish fuel runs with the times done at the start of race-simulations, such as those by Red Bull and Lotus. But Ferrari did not do one. And while Alonso had the quickest average lap time of anyone all week, taking into account all the laps done by each team, that figure is skewed by him not having done any high-fuel runs. Complicating the picture further, the cars are not yet in the specifications in which they will start the season. That comes towards the end of next week's final test, when all will have Melbourne-spec upgrades to try out. As Lotus team boss Eric Boullier puts it: "Then we will be able to draw some conclusions." In the meantime, there is one thing everyone does seem to agree on - no-one will be running away with it this season. "I don't think there are one or two stand-out teams at the moment," Button said. "It might be like that at the first race but there is no-one who stands out as being obviously superior."